In Louisiana, Brendan Causgrove‘s first encounter with an oyster did not go well. He choked on the plump specimen at the bottom of a hard-alcohol shot after knocking it back. Brendan Causgrove. Photo via THOMSON REUTERS FOUNDATION/Sebastien Malo. The shells are then left to dry in the sun for six months, to kill off any bacteria, before being put into cages that are planted on bare seafloors or riverbeds to form protective walls. 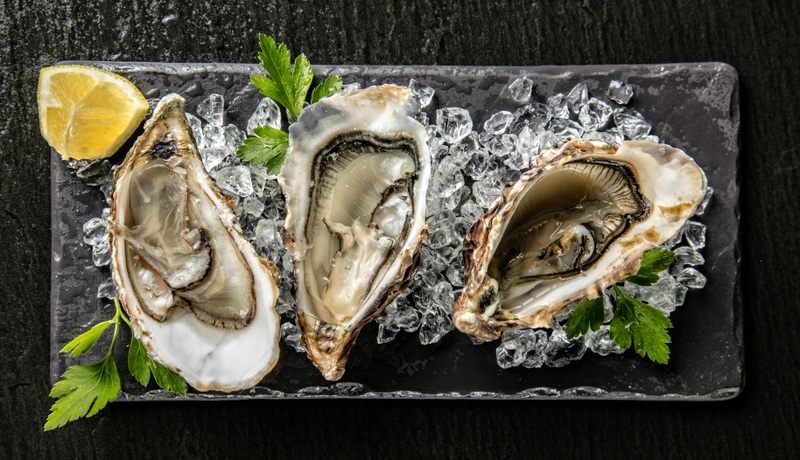 The brand new reefs offer an inviting home for oysters. 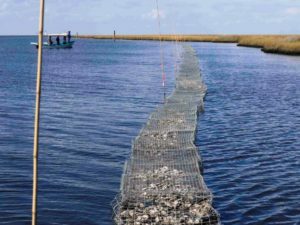 Those benefits are boosting the popularity of man-made oyster reefs as a natural alternative to hard infrastructure like seawalls, which are often made with cement, said Alex Kolker, a professor at Louisiana Universities Marine Consortium. There is no national database tracking the total mileage of oyster-shell coastal protection projects, experts say. But Bryan DeAngelis, a program coordinator at The Nature Conservancy (TNC), said there are signs the technique is entering the mainstream. 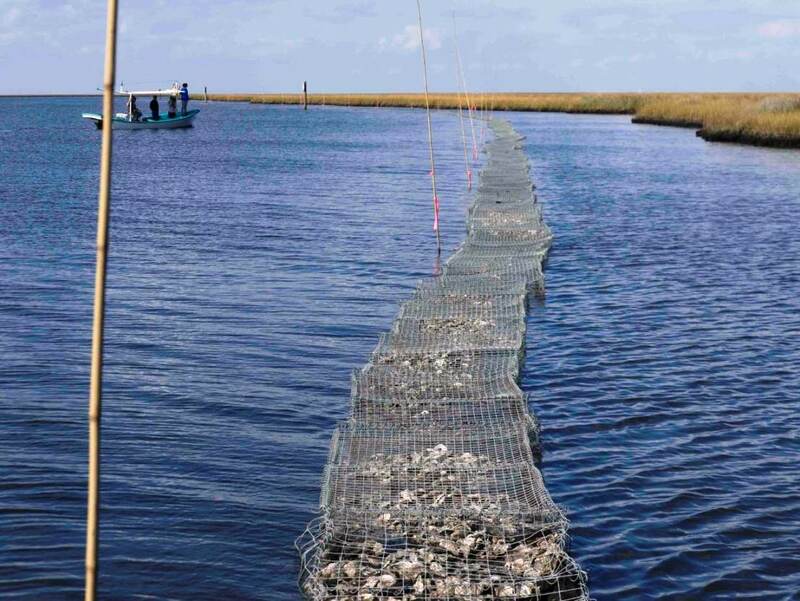 Just in Louisiana, 6 miles (10 km) of protective oyster reefs have been set up with TNC’s help, he said. 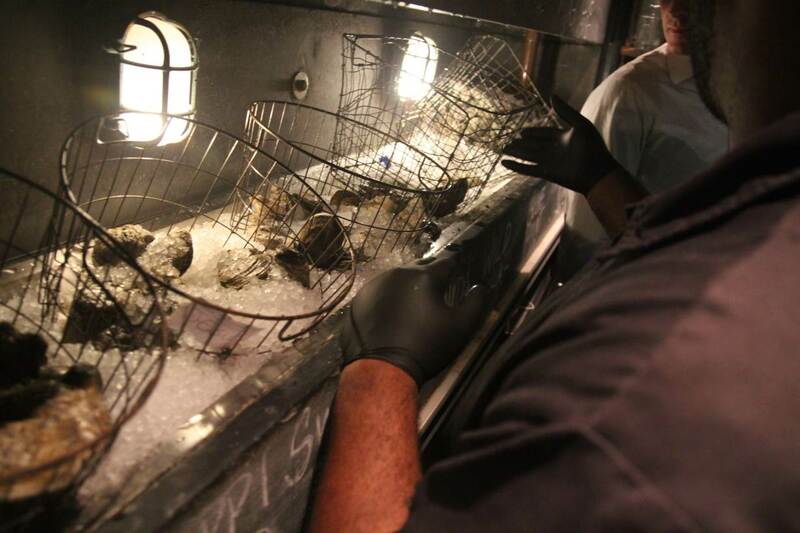 A restaurant employee chucks an oyster at Seaworthy, a seafood restaurant in New Orleans, Louisiana that recycles the mollusk’s shells as part of a community project to build oyster-shell made breakwaters. November 16, 2018. Photo via THOMSON REUTERS FOUNDATION/Sebastien Malo. 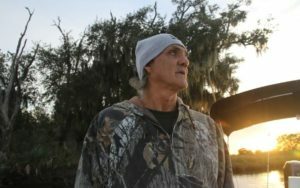 In the wetlands outside town, a 10-foot (3-m) mound stands shrouded in dense vegetation, said to be a burial or ceremonial ground, according to the 63-year-old with leathery skin and piercing green eyes. “So we respect it, stay off of it,” he said. Two years ago, the shrimp fisherman decided to act. “It’s just part of history that I don’t want to see washed away,” he said. Local scientists examine a portion of a newly constructed oyster reef in Lake Athanasio, Louisiana, November 18, 2016. Photo by Coalition to Restore Coastal Louisiana. But not all is plain sailing. At a recent meeting, tribe members expressed frustration at red tape holding things back. “It still bothers me big time right now because it’s taking so long to get this going and protect (the site),” said Dardar. Recognition of their value independent of food can be traced to the 1950s, when shells started to be used in the United States as paving material and railroad ballast, as well as to make cement, he said. “By the late 20th century some scientists realized, ‘These things are buffering storms’,” added Booker. Seven years on, the academic – one of the first to promote protective oyster reefs through his research – warned the measure was buying time, but as sea levels rise with climate change, more drastic action may be needed. “What people really need to be thinking about is maybe moving away from the shoreline a little bit,” he said. This article by Sebastien Malo (@sebastienmalo) was edited by Megan Rowling, and was originally published by the Thomson Reuters Foundation, the charitable arm of Thomson Reuters. Reprinted here with permission. See Coalition to Restore Coastal Louisiana website.